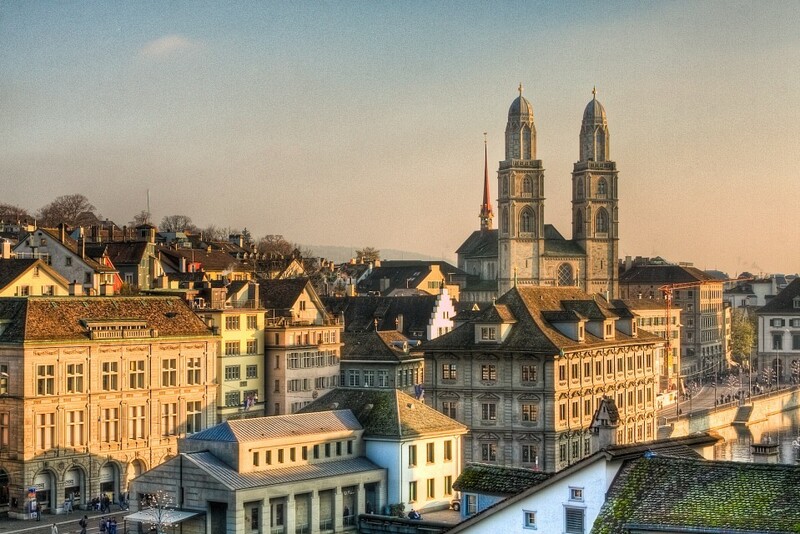 Zürich, the largest city in Switzerland, is located centrally in the country. 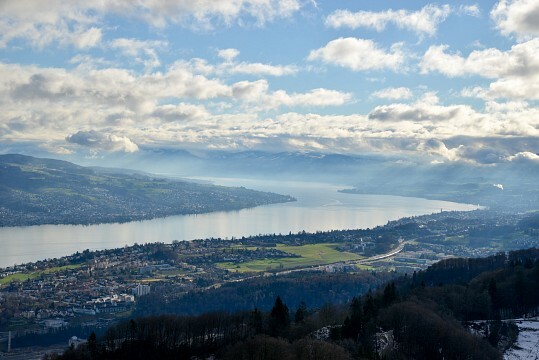 The city has a population of 383,708 people, in an area of almost 55 miles squared, and sits at the end of Lake Zurich, one of the largest in Switzerland. In 1351, Zurich became the fifth member of the Swiss Confederacy, after Zurich citizens swore allegiance in front of the other representatives. Zurich was for some time the capital of the Federal Republic of Switzerland, from 1839 to 1840 and again from 1845 to 1846. 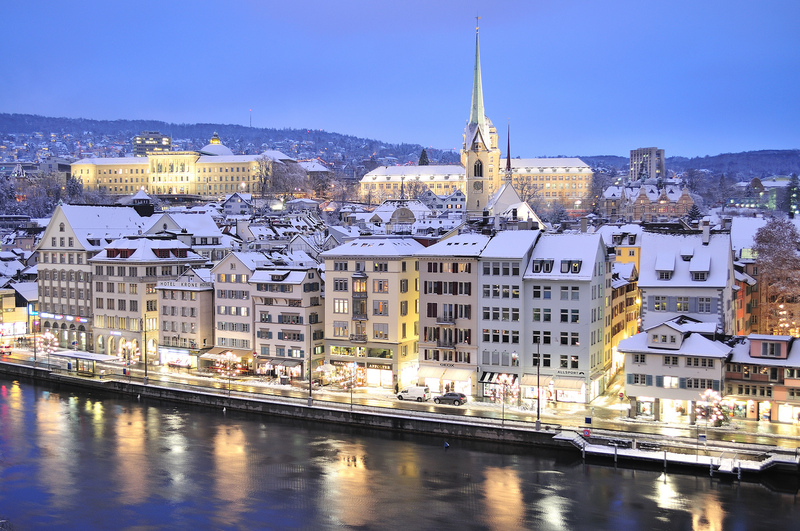 Many of the symbolic aspects of Zurich today have stayed much the same since they were established. The Hauptbahnhof, Zurich’s main train station was the first in the Swiss railroad system, and the original building dates back to 1871. Zurich’s famous Bahnhofstrasse, today the main shopping street, was first built in 1867, and as the city began to industrialize, people migrated from the countryside to the city. 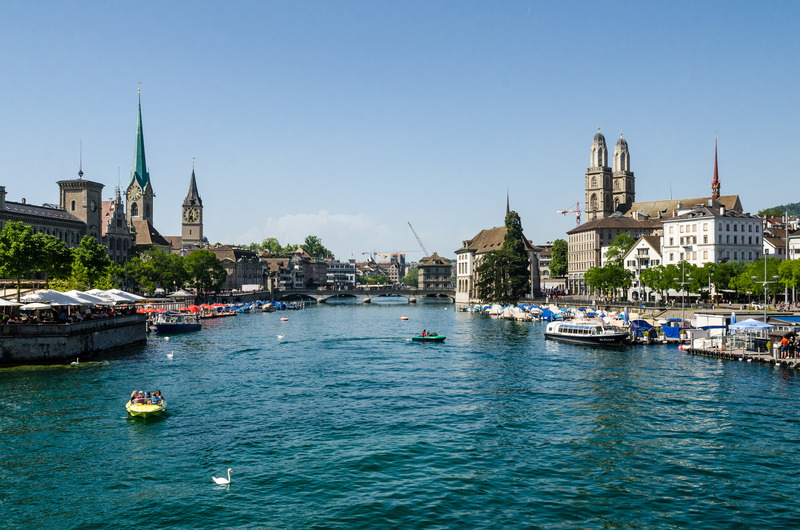 Zurich, like the rest of Switzerland, experiences four very distinctive seasons, with cold, snowy winters, and hot dry summers, making the country truly spectacular, no matter what time of year you visit. The Altstadt , or Zurich’s Old Town, encompasses what was Zurich before 1893, and now is a district of shops and restaurants as well as the Grossmünster, a protestant church, and one of the largest churches in Zurich. 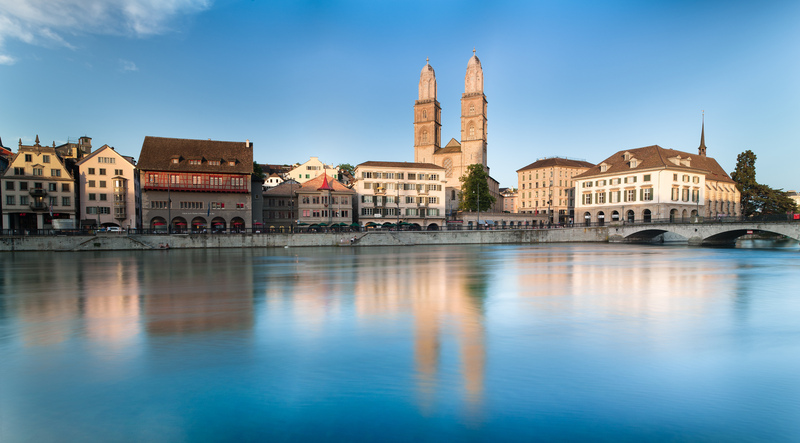 Many pictures of Zurich feature the Grossmünster, with its two towers crafted in a Romanesque style. Every summer there is a public pillow fight outside the church, and each year an increasing number of participants enjoy whacking one another with pillows. The Old Town also features Lion’s Park, which is actually more of a lookout point than anything else. Locals enjoy playing chess and cards on the benches in the summer, and tourists often visit the park for a great view of Zurich Lake and the Old City. Many enjoy simply wandering through the old cobbled streets of the Old Town, stopping for coffee or lunch. There are lots of great boutique shops, and some fascinating statues, that give a brief description of their history. Lake Zurich is a must when visiting Zurich. With a surface area of 34 square miles, the lake is situated at the southern end of the city. In the summer, you are able to rent paddle boats, as well as motorboats for use on the lake, and many locals go swimming in the lake at any one of the public swimming areas situated all along the coast. You are able to take a boat ride around the lake, offering scenic views. A 90-minute ride is $ 9.00 USD per person, and you ride in a glass-topped boat, with drinks service on board. Pick-up point is from the Old City of Zurich. The lake has frozen in the past, and when it does people are able to go ice skating. However, don’t count on this activity as it has to be extremely cold for it to freeze! 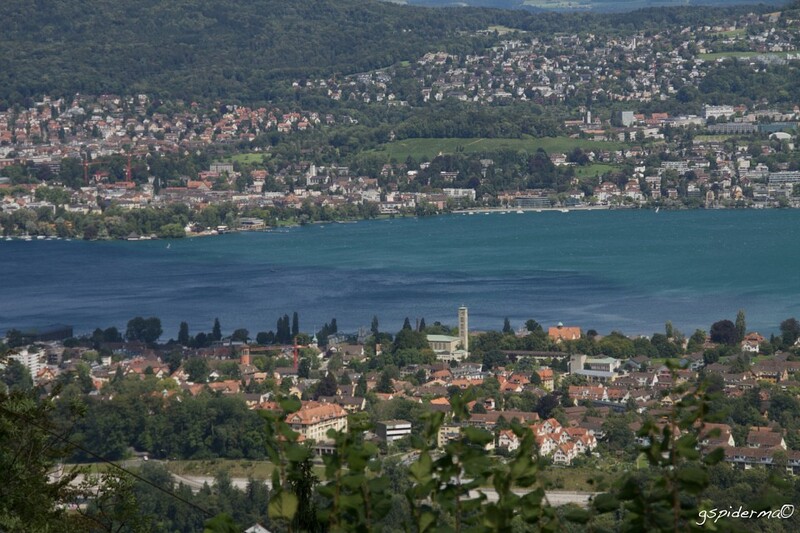 Uetliberg gives a great vantage point over Lake Zurich. 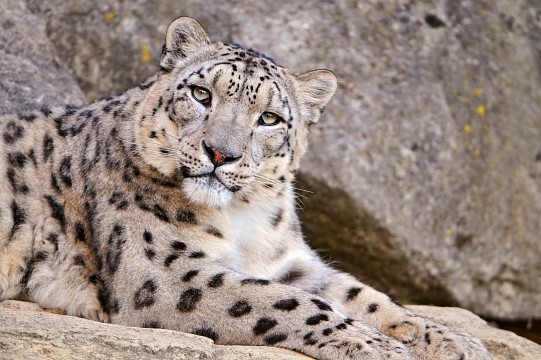 Zürich Zoologischer Garten, situated on the hillside near the University of Zurich, is a great day out for kids and adults alike. The zoo features large enclosures for most of the animals, and you can find penguins, lions, and camels. Recently there was the addition of the Masoala Rainforest, a room filled with tropical plants and animals that visitors are able to walk through. To get there take tram number 6, and get off at the stop marked Zurich Zoo. Entrance is 26 CHF for adults, 19 CHF for young persons, 13 CHF for children up to age 15, and children under six years go free. The zoo also offers guided tours, and is open every day of the year, from 9.00AM to 17.00PM in the winter, and 9.00AM to 18.00PM in the summer. If you are looking to avoid the crowds, go on a Saturday when they have extended opening hours into the night. Bahnhofstrasse is Zurich’s main shopping street, starting at the Zurich train station, and continuing all the way down to the lake. Reportedly Europe’s most expensive street, Bahnhofstrasse is lined with designer shops, as well as high street shops, and anything you are looking for can be found here! Starting at the train station are the more affordable shops and as you walk down, the shops get more and more expensive. If you’re looking for vegetarian food, head to Sihlstrasse, where you’ll find Hiltl. Open for lunch and dinner, there is a large buffet offering a wide variety of food, including hot and cold dishes. Dishes are charged by weight, so whether you’re feeling hungry or just a bit peckish, you only pay for what you eat. Even if you’re not vegetarian the food is so good, you’ll want to go! If you are going for dinner on a weekend, make sure to call ahead and book as it gets busy. It is also a great place to go in the summer, as they have an outside veranda. For authentic Swiss food, check out Zeughauskeller, located just opposite Paradeplatz. The restaurant is in an old beer hall, and serves only rustic Swiss food, including sausages, rösti, and schnitzel. For something unique to Zurich, order the Zurichergeschnetzels, finely chopped pieces of veal in a mushroom sauce. Be sure to make a reservation as it is always busy, and be warned that there will be lots of noise and rushed atmosphere – the food however is definitely worth it. For those looking for something sweet, Sprungli café is the answer. They have a few shops around the city, and are the other half of the famous Lindt chocolate brand. Don’t bother with the sandwiches, which are extremely overpriced, but do check out the macaroons, and truffles, all great souvenirs. The Lindt chocolate café, located in Kilchberg, a town just outside Zurich offers chocolate-making classes and a tour of the factory. You can also buy ‘defect’ pieces of chocolate at a hugely discounted rate. The Widder Hotel, a luxury five-star hotel in the center of Zurich. One night is upwards of $ 750 USD , making it truly high-range, however the facilities and service make it worth it. With tennis courts, a fully equipped fitness center, bar, lounge, and restaurant, the Widder Hotel has everything you would expect from a five-star hotel. There is also free WiFi throughout the hotel, as pets are allowed, as long as you phone ahead to make arrangements. The location makes this hotel very appealing, located only ten minutes from the train station and just two minutes from the heart of the Old Town. Breakfast buffet with hot items and minibar snacks and drinks are all included, and you can choose from a variety of standard to deluxe suite rooms. The 25hours Hotel Zurich West is located just a short ten-minute tram ride from the center of the city. For 150 CHF a night, you get a modern, stylish room with access to a spa, fitness center and gym, and a buffet breakfast included. There is also a restaurant featuring Asian fusion food and bar in the hotel for those who prefer not to go out. 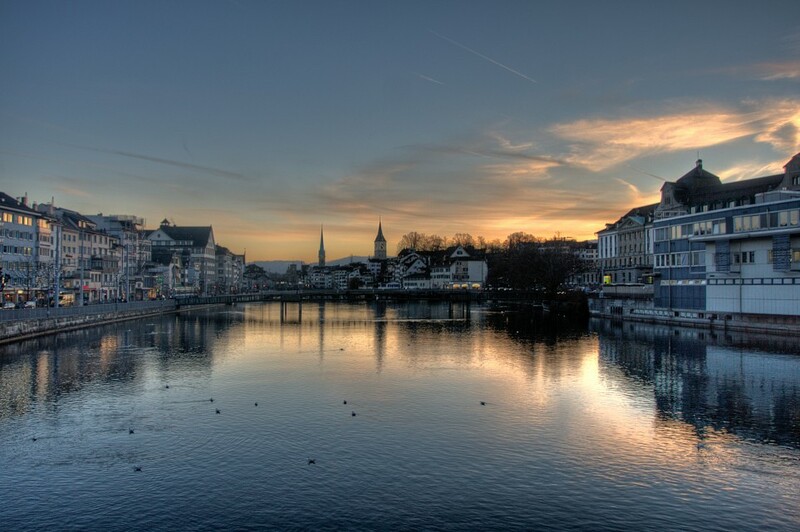 The hotel is located on Pfingstweidstrasse, next to the Limmat River providing great views. You’ll be hard-pressed to find a room in Zurich for under 50 CHF a night, but City Backpacker – Hostel Biber comes pretty close. With private rooms for 60 CHF a night, and shared rooms considerably less, the hostel comes with everything you need for a comfortable night. Located at the beginning of the Old City, you are in the perfect place to enjoy nightlife, restaurants, bars and all the sights, as well as being just a five-minute walk from the lake. There are a number of kitchens that can be used by guests, as well as laundry facilities, luggage storage and computers connected to the internet. 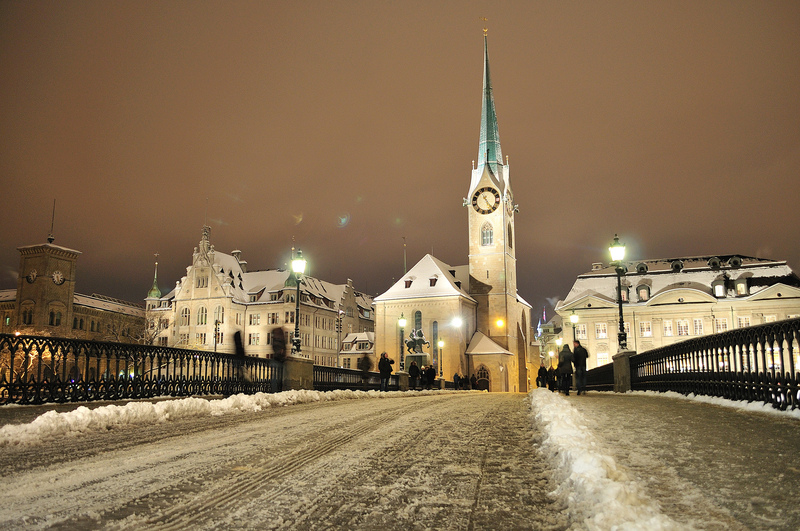 Zurich is relatively safe for a city of its size, but some precaution should still be taken. Hanging out inside the train station is not recommended at night, especially during the week when there are fewer people around. They do have police stationed on the weekend, so stand next to them if you find yourself alone in the station at night. Single women should take precaution around all parts of the city at night, but especially in the Langstrasse district, which has recently become more hip, although it used to be part of the Red Light district, and still attracts some homeless people and drug users. Violent crime and burglary are still rare, and residents pride themselves on living in such a safe place. 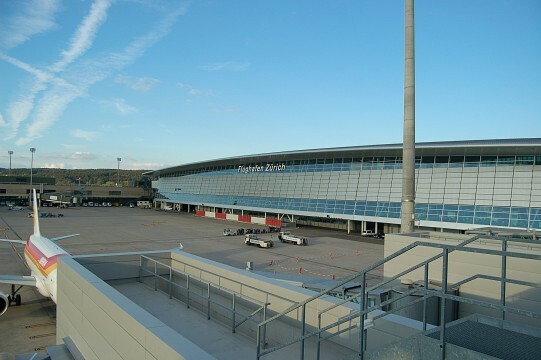 Zürich Airport is a large international airport, located just twenty minutes by train from the center of Zurich. Most international airlines fly into Zurich, and in recent years it has become a transport hub for connecting flights from all over the world. To get into Zurich you can either take a direct train which runs about every twenty minutes, and tickets can be purchased from the station inside the airport. You can also take a licensed taxi but be warned that these are much more expensive – in fact Zurich taxi’s are the most expensive in the world, and the trip to the center will cost you as much as 100 CHF but certainly no more. Travelling by train into Zurich from other European cities is also very convenient, with direct trains from Paris, Milan, and Munich. If you are planning on travelling around Europe by train you should look into getting an Interrail card that can be used for travel all over Europe. 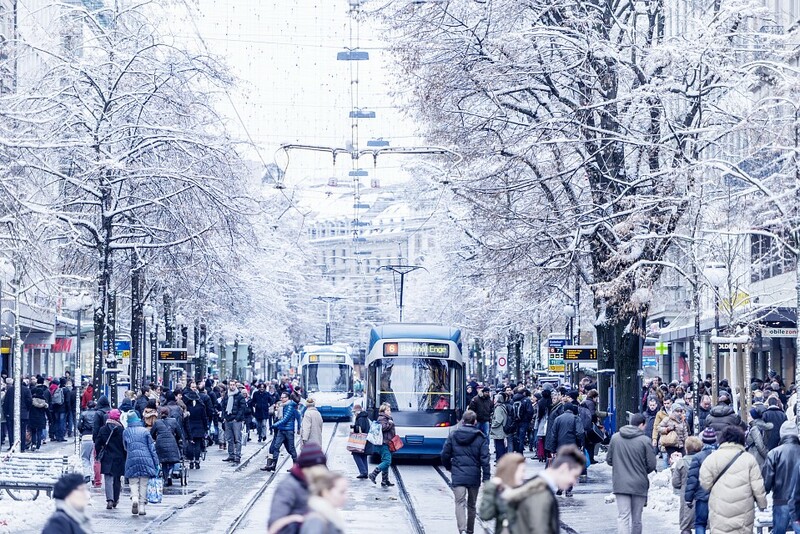 Within Switzerland there are special fares you can get that allow you to travel on all modes of public transport for the duration of your stay. These can be bought at airports and must be bought before leaving the airport, so as to verify that you are a tourist.